Orange Picker is one of the six minigames in DK: Jungle Climber. It's one of the games in Challenge mode. The objective is to exceed a certain score to unlock the next level of that minigame. 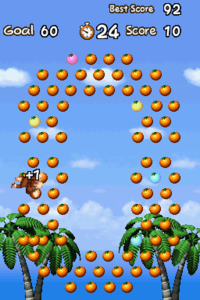 To score, the player must climb an arc of oranges, with each orange being worth one point. There are also special flashing oranges worth five points. If the player successfully completes all the challenges with a certain limit to pass it, a special max stage will be unlocked. The max mission involves grabbing as many oranges as possible while avoiding Mines. The game is over if the player misses an orange. This page was last edited on October 3, 2018, at 08:34.